Desh Bhagat University, best private university in Punjab (NIRF Ranking, MHRD Govt. 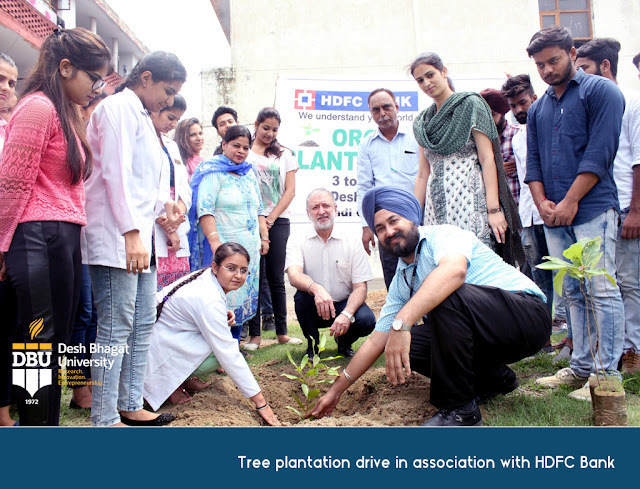 of India) Faculty of Ayurveda & Research organised a tree plantation drive in association with HDFC Bank, Amloh Branch. Students and Faculty members took part in it with full enthusiasm. University Chancellor Dr. Zora Singh inaugurated the event by planting some herbal saplings in the compound of Ayurveda College. Speaking on the occasion he Said, 'By planting trees we return to a more natural, less artificial environment and natural harmony is restored even to the urban environment'. 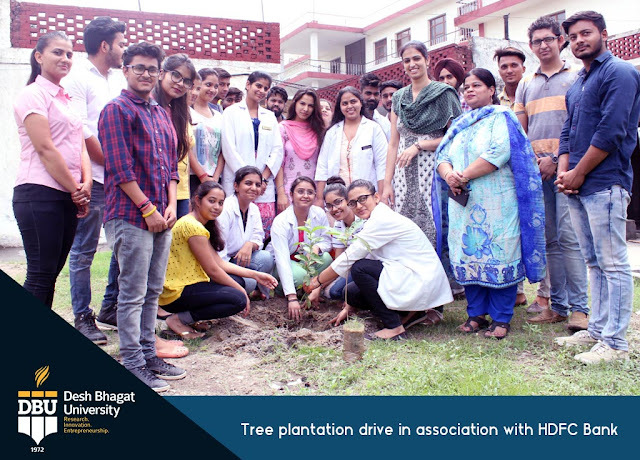 While giving the details of the programme, university Vice-Chancellor Dr. Virinder Singh said that the students planted more than five dozen saplings in the university campus and surrounding areas. These students will not only take care of these plants, but they will also do their research work on these plants. The main objective of this programme was to create awareness among the students about tree plantation and deteriorating environmental situation, he added. Pro Chancellor Dr. Tajinder Kaur who is CEO of Hara Punjab Khara Samaj (an NGO under the ambit of Desh Bhagat United ) appreciated the initiative taken by the students and the bank. saying that one of the objectives of our institution is to cover maximum area of Punjab under greenery. Present on the occasion Director, Faculty of Ayurveda Dr. Kulbhushan praised the students for creating awareness among fellow students. Students also took a pledge to plant maximum trees and inspired others for tree plantation and their protection. They also made posters and banners to spread awareness regarding importance of environmental preservation.